While Microsoft’s blockchain supply chain group, Project Manifest, is gaining traction with potential partners, the effort to track everything from auto parts to medical devices remains tightly held under non-disclosure agreements. Still, that isn’t stopping those involved from dropping hints about the group’s progress. Soon after providing a sneak peek at the technology last week, Dan Doles, CEO of supply chain tech firm Mojix, revealed plans for an upcoming test, describing a more academic project being spearheaded by another Project Manifest member, Auburn University. In total, Doles said a group of more than a dozen companies is now working on the project in the laboratory. Revealed exclusively to CoinDesk in January of this year, Project Manifest debuted just a week after Microsoft and Mojix confirmed the participation of two professors and 10 students in the project. Further, while details of Project Manifest’s work with Auburn University’s renowned RFID Lab are not being disclosed, lab director Justin Patton told CoinDesk that a white paper is currently being developed, and that the names of additional participants are likely to be revealed upon completion. To give an idea of the scope of the work being undertaken by Auburn University’s lab, sponsors include Mojix, along with Amazon, FedEx, Target, Home Depot and more. By making improvements to traditional radio frequency identification (RFID) technology, and combining it with the electronic data interchange (EDI) transaction standard, the group has already been able to make improvements to the traceability of supply chains using existing centralized databases, Doles explained. However, Mojix and the rest of Project Manifest are now working to turn a distributed ledger into the “connective tissue” that gives complicated cross-industry supply chains real-time accuracy, according to the CEO. Increasingly this year, the global supply chain has come in the sights of blockchain disruptors. With the strong correlation that exists between efficient supply chain management, increased revenue and profit, a number of companies have entered the space. In April, US software firm SAP Ariba partnered with blockchain supply chain startup Everledger, and shortly thereafter IBM joined up with Chinese supply chain management firm Hejia for its own blockchain trial. Another recent trend is that ‘blockchain supply chain’ also means moving trade finance to a blockchain, with Taiwanese manufacturing giant Foxconn spinning off a related startup with P2P lender Dianrong, and Chinese lender CreditEase launching its own blockchain service. As industry leaders continue to push the technology, Mojix, too, has plans: namely, to deal with the issues of incorporating blockchain benefits into existing enterprise applications. 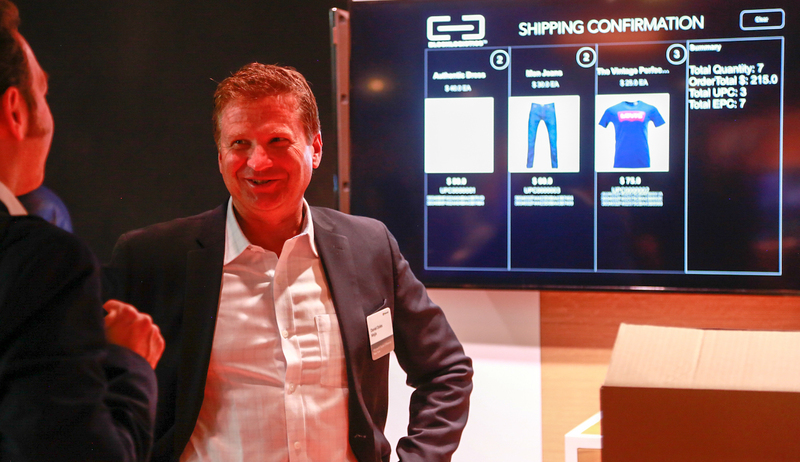 “The next step is we’re going to take two to three retailers and set up automated verification, RFID readers, so we can track either shipments or receipts,” said Doles, as he used one of his company’s readers to scan a box of shirts from several feet away. If all goes as planned, decentralizing the supply chain could have trickle down effects to smaller contractors, according to Microsoft’s global business strategist in charge of blockchain. To test that idea the Project Manifest proof-of-concept currently being built is being designed use specially designed ‘adapters’ that connect RFID scanners directly to the ethereum blockchain. Brand-owners that ship goods, and the retailers that receive them, would then automatically trigger a diverse set of smart contract functions.